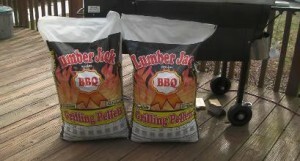 We are a proud dealer of Lumberjack Brand BBQ wood pellets. Locally made in NW Wisconsin. These pellets contain no fillers. We are dealer of Lumberjack Brand BBQ wood pellets. Using these wood pellets in your Louisiana Pellet Grills and Traeger Grill gives your food a great flavorful smoked taste! Contact us today for your order of wood pellets!